"I'm frustrated with the continuous belief and, I think, self-delusion that Islam is only a religion,"
The Prophet Muhammad defined the state of peace and tolerance as a moment when the entire world submits to Allah and embraces Islam, said Hirsi Ali. In Islam, the way to achieve peace is through settlement, jihad, and the institution of sharia (Islamic law), she explained. And before the state of universal Islamization, "it is the duty of every Muslim male to wage war" – not just by carrying weapons but by preaching and persuading, she added. WASHINGTON – Though most Muslims are tolerant and peace-loving, Islam itself is not a religion of tolerance, a former Muslim asserted. Well-known activist and author Ayaan Hirsi Ali made the argument Monday at the National Press Club as security guards stood in the back of the ballroom. An outspoken critic of Islam, Hirsi Ali has been living under a fatwa, a religious ruling or in this case an order to kill, for years. The Somali native addressed the question "Is Islam a Religion of Tolerance?" to highlight the political dimension of the widely practiced faith. "I'm frustrated with the continuous belief and, I think, self-delusion that Islam is only a religion," she said. "Islam is more than a religion. It does have a spiritual dimension ... but there is another dimension to Islam – a political dimension." In general terms, religious tolerance is understood to be the willingness to recognize and respect the beliefs and practices of others, she noted. But there are different levels of tolerance, she added. "For instance, if you oppose smoking you may think of yourself as tolerant of smokers but it's different when you allow a smoker in your house ... to smoke," the now atheist pointed out. The Prophet Muhammad defined the state of peace and tolerance as a moment when the entire world submits to Allah and embraces Islam, said Hirsi Ali, who fled from her Muslim family and an arranged marriage in her early twenties and sought asylum in the Netherlands. "That word 'peace,' 'tolerant' is not defined in Islam as you define it in the West," she clarified. "It doesn't mean ceasefire or compromise. That's temporary. "The proposition that Islam is tolerant is not only fallacious but it's also dangerous," Hirsi Ali underscored. Citing four main sources of Islamic jurisprudence, including the Quran and the Hadith, the former Muslim said she found explicit commands to conquer and guidelines of how to go about that. The sources also describe in detail how Muhammad, who carried out over 60 military campaigns, defeated his enemies. She also found war tactics, the concept of deception, legislation on crime prevention, punishment of behavior such as the hanging of apostates and the stoning of adulterers, and laws governing family matters such as divorce and marriage. While U.S. policymakers focus their attention on armed militias such as Al-Qaeda and Hamas, other groups such as the Muslim Brotherhood and nongovernmental organizations – which have "postponed" violence and chosen a method of preaching, settling and slowly infiltrating – are being overlooked, she noted. "The idea that Islam is [of] peace, tolerant and compatible with Western political theory and values, I think, seems to be useful more as a strategy and not as a pursuit of the truth," she maintained. That strategy, she explained, is as follows: Given the fact that there are over a billion Muslims in the world, that the world is globalizing at a fast pace, and that America is a model empire (that doesn't wipe out enemies), we (the U.S.) should practice self-restraint and use political skills, diplomacy and tools of persuasion until we're able to get around the conflict. "The hope is we will be able to pacify Islam." Nothing, she said, angers Muslim elites more than the criticism of Islam. Unlike with other faith groups, Muslims do not appreciate the questioning of the moral perfection of the Quran and Muhammad. 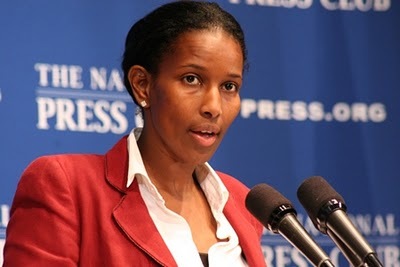 Though an atheist, Hirsi Ali has advocated for the conversion of Muslims to Christianity. Clarifying her position on Monday, she said she supported "opening up the competition." "[Muslims] want to have complete monopoly on Muslim immigrants who first came to the U.S. not to spread Islam, not to settle or infiltrate but to lead normal, peaceful lives," she said. "For them to incorporate all the diverse ethnic groups, they need to get ... to them fast and convince them of sharia agenda." "What we can do is open up competition," she continued. "In a country like the United States, you are free to peddle your political theory or philosophy. We are going to go to those same communities and educate them on other competing ...philosophies and challenge [the] principles of Islam. You can start that competition as a Christian, as a humanist, as a feminist." Hirsi Ali is open to Christians converting Muslims because Christianity has "evolved from absolutism to tolerance, to compassion, to peace," she said. She has found that most people do not want to be an atheist. "I'm only acknowledging that the Christian God has gone through the reformation, has gone through enlightenment," she added. "In general, things have evolved to the point where I think that the Christian religion, especially as it is practiced in the West, is much more attractive and far less dangerous than the Islamic God. "Given the fact that this is almost a losing battle because we are not taking them (Muslims) on ... and given the fact that there are very moderate Christians who offer that combination of a spiritual satisfaction with modernity and the respect and sacredness of life, liberty and human rights, I think it would be wrong and neglectful not to involve Christians to go after that demography of 1.57 billion Muslims who today, I think, many of them are seeking a concept of God and are now only getting Allah." Hirsi Ali's appearance comes just weeks after she participated in a debate on whether Islam is a religion of peace at New York University's Skirball Center for the Performing Arts. Her latest book, Nomad: From Islam to America – A Personal Journey Through the Clash of Civilizations, was released this year.